The memorial at the site in south-central Croatia of the largest and deadliest Nazi concentration camp in the Balkans during WWII. All the physical structures were destroyed and removed after the war, so that nothing of the original camp remains, but in the 1960s, during the Yugoslav era, a large symbolic monument was erected, followed by the setting up of a dedicated museum. The site, and the museum in particular, suffered badly during the Balkan wars in the 1990s (the “Homeland War” in Croatian parlance), but has since been restored and modernized. Jasenovac is certainly one of the most significant sites related to the Ustashe Nazi era in Croatia, and as such a prime dark-tourism destination too. More background info: See under Croatia for the general political-historical context, the Ustashe and the Independent State of Croatia (NDH). Immediately after the WWII German and Italian invasion of Croatia in April 1941 and the establishment of the NDH Nazi puppet state, the Ustashe started rounding up real or assumed enemies of their ultra-nationalist and racist ideology (ethnic Serbs, Jews, Roma, communist Croats, and so on) – and to this end various collection points and camps were set up, some of them only temporarily, but a few also for longer operation. The main concentration camp, the largest, and the one that was in operation the longest, was Jasenovac. In was more a cluster of camps in close proximity to each other than a single large camp (such as Buchenwald), but it was one administrative entity. The location of the camp was chosen for a variety of reasons. Firstly, it was close to a railway line that could facilitate quick transports of prisoners to the camp. Secondly, it was a remote marshland location where access was often difficult due to frequent flooding of the Sava River, so there'd be few witnesses. Thirdly, the Ustashe could simply seize some industrial structures and businesses, including a brick-making plant, which had been abandoned by their Serb owners who had fled before the Ustashe could get them. Moreover it was an area mostly inhabited by Orthodox Serbs – and they were the largest group of those targeted. In Jasenovac village itself, all the Serbs were sent to the camp and their houses were taken over by the Ustashe. The Croatian villagers remained but had to live with many restrictions, e.g. needing passes to go from their homes to their fields. So they witnessed what was going on, and some tried to help the prisoners, e.g. by throwing food items over the fence, even though in doing so they risked being imprisoned or killed themselves. Initially the Jasenovac concentration camp was set up at some point in the summer of 1941 as a forced labour camp, where inmates had to work in the brickworks, in a tannery and other workshops. However, the importance of forced labour soon diminished and Jasenovac became effectively a “death camp”, though not in the strict technical sense as the three Operation Reinhard camps in eastern Poland. There were no gas chambers at Jasenovac – instead victims were killed “by hand”, hanged, shot or bludgeoned to death. And the “living” conditions in the camp were so appalling, with meagre food rations, lack of sanitation and cramped accommodation, that many prisoners also succumbed to various diseases. The camp area was secured by a fence and watchtowers and bunkers with armed guards – in total the camp was run by some 1500 Ustashe – and so there were only a few escape attempts (and almost all failed). Moreover the nearby railway line was guarded by German military (as it was an important line between Zagreb and Belgrade and beyond), which might help explain why the partisans didn't attempt to liberate the camp. Especially in late 1941/early 1942 and again in the late phase of the camp, newly arrived prisoners, mostly ethnic Serbs from a region in which partisans were active, were killed almost immediately, in particular at a site on the other side of the river (Donja Gradina – see under combinations) that was more secluded so the mass killings could go on more “discreetly”. Jews were initially also killed at Jasenovac, but from 1942 onwards the Ustashe generally handed Jews over to the Germans to be deported to Auschwitz. So Jasenovac did play a role in the Holocaust, but its main victims were Serbs. Statements about the total numbers of victims at sites like this are usually contested – and nowhere is this the case more than in the context of Jasenovac. Here the figures given have ranged from less than 20,000 to well over a million. The higher figures are most probably inflated, often for political reasons, just as those lower numbers are probably played down for other political reasons (depending on whether you ask e.g. a nationalist Serb or a nationalist Croat). The truth will probably lie somewhere in between, but where exactly is hard to ascertain. Ongoing research by the Jasenovac Museum currently puts the total death toll at between 80,000 and maybe 100,000 (the USHMM gives similar figures). And while that is far lower than the highest claims, or those that became standardized during the Yugoslav period (700,000), it is still a significant number. And it still puts Jasenovac among the most deadly Nazi camps of them all (far ahead of, say, Dachau or Buchenwald). Yet the issue remains a bone of contention – with various claims hotly debated. (I experienced how explosive the topic can be myself once, when I had an angry complaint by email simply because I had *quoted* the figure given at the Donja Gradina site – see below). Jasenovac was in operation until almost the end of the war. As partisans approached the area, there was a prisoners' revolt on 22 April 1945. While many were killed, some managed to escape. After that, the Ustashe abandoned the camp and the village of Jasenovac – and forced the remaining people there to travel with them to the west. The camp's remaining buildings, which had already been badly damaged by Allied bombing raids, were blown up and burned by the retreating Ustashe so that when the partisans finally arrived at Jasenovac in May they found only empty ruins. Over the following three years the rubble was cleared, and what was still usable as building material was taken by locals to rebuild their homes. Infrastructure, a bridge and the railway line, were repaired. But the camp's grounds as such, with only traces of foundations remaining, were left bare and became completely overgrown after 1948. In the 1950s, initial attempts were made to mark the camp and erect memorial signs at the locations of mass graves. In the early 1960s, the Yugoslav government invited proposals for the site to be turned into a proper memorial. The winning proposal was that by Bogdan Bogdanović, who had already designed several memorials and would go on to establish himself as Yugoslavia's most prolific and celebrated designer of such sites (including the Dudik memorial in Vukovar). He argued against any reconstruction of the camp and instead used the area as a “clean slate”, only symbolically marking the locations of camp buildings and sites of executions through “earth art”, namely hollows and mounds, respectively. 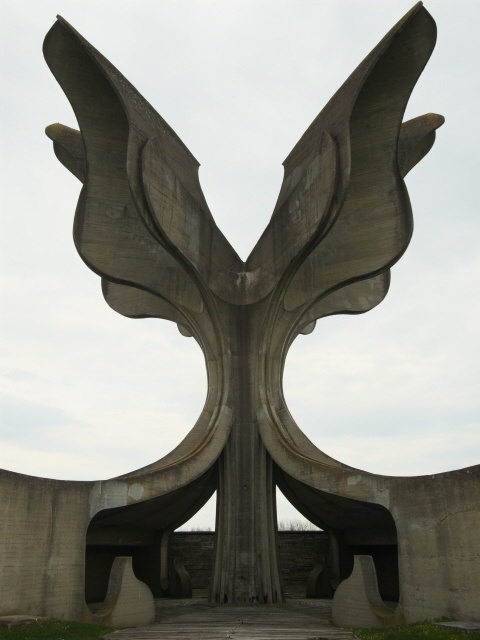 At the centre of the memorial Bogdanović placed a concrete monument – a “Stone Flower”, as a semi-abstract symbol of peace, life and freedom. The sculpture remains one of Bogdanović's most famous works. Construction began in 1963 and the monument was inaugurated in 1966. The following year a museum was added and subsequently further landscaping of outlying parts and marking of mass graves, also in Donja Gradina, were undertaken. Every April, large commemorative gatherings were held at Jasenovac year after year until the outbreak of the Yugoslav wars in the 1990s. Soon after Croatia declared its independence, i.e. secession from the Federation of Yugoslavia, Jasenovac found itself on the front line. From October 1991 the JNA (Yugoslav Army) and Serbian Krajina paramilitary forces occupied the area. 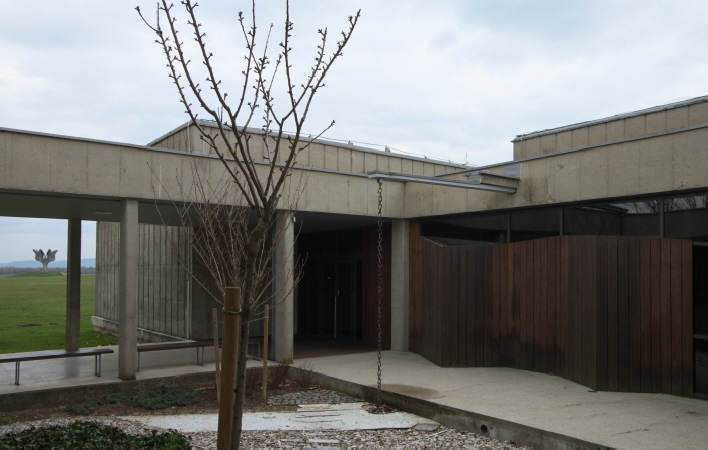 At that point, the curators at the museum of Jasenovac, having found themselves on the Serbian side of the new front line, decided to move the collection to safety, in Banja Luka, a city in Bosnia-Herzegovina under Serbian control. In the following war years the museum building of Jasenovac suffered massive damage – it was almost gutted – but the Flower monument survived the war unscathed. After 1995, the museum collection first remained in the Serbian part of BiH, and was also used for temporary exhibitions in Serbia about the Ustashe and Jasenovac. Later a large proportion of the museum collection was transferred first to the US Holocaust Museum in Washington DC, and from there eventually returned to Jasenovac after the place had been reintegrated into Croatia. About 30% of the original collection was missing, though, and the whereabouts of these items could not be clarified. Still, it was a good basis for re-establishing the museum. By 1999 an assessment and a plan had been draw up and reconstruction began in 2002 and was completed in 2003. The newly designed museum exhibition finally opened its doors to the public in 2006. In independent Croatia, Jasenovac occupies a difficult space, historically/politically, as contemporary Croatia tends to see itself as a victim of Serbian aggression in the Yugoslav wars, which it was able to push back victoriously in the end by 1995. So the narrative of Croats having been the perpetrators of ethnic cleansing and mass murder of Serbs between 1941 and 1945 is uncomfortable to nationalist Croat minds – and this is probably the reason for many attempts to downplay the role of Jasenovac (and its death toll). For nationalist Serbs, on the other hand, more or less the opposite is the case (which may explain why at the Donja Gradina memorial site across the river in the Republika Srpska part of BiH the old inflated victim numbers are still on display). Since the ethnic tensions between these groups are still simmering beneath the surface, any discussion of Jasenovac's history is full of pitfalls. What you say about the one side may outrage the other and vice versa. I'd like to make it clear, therefore, that I am not taking anybody's side here, and have tried as best I could to present what I've been able to find out about Jasenovac, from the sources available to me, in as neutral a manner as possible. What there is to see: Of the original camp virtually nothing remains. All buildings and structures are gone. Only a few smaller relics are on display in the museum. The vast area of the former camp is mostly a bare field of grass plus two artificial lakes. Other than that there are grass-covered earth mounds and hollows that symbolically indicate the locations where various parts of the camp's structures and buildings, as well as sites of executions, would have been. A roundish bronze plaque with a “map” of the whole site (including a little model of the main monument – see below) provides the only bit of commodification here, namely in that the various representations of those locations are numbered and a list below states what is/was at those locations/numbers. The labelling, however, is in Croatian only. So unless you speak the language, most of these labels remain cryptic, except for a few obvious ones such as “kantina” ('canteen') or “pumpe za vodu” ('water pump'). 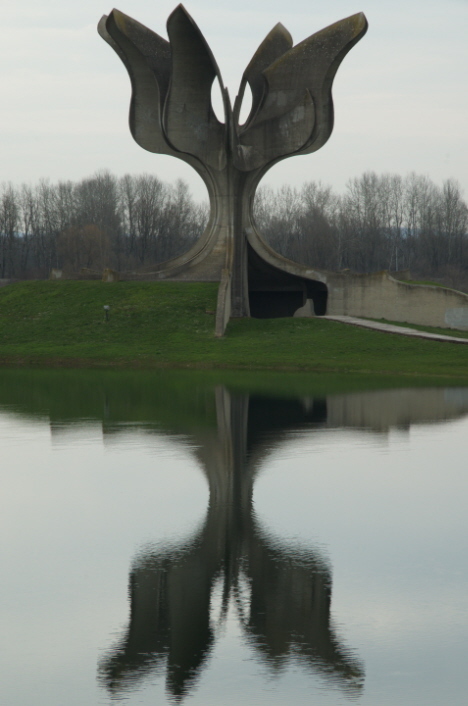 The main thing about this memorial site is the central monument, called the Stone Flower of Jasenovac. It is one of the most celebrated masterpieces of Yugoslav architect and memorial designer Bogdan Bogdanović. The gigantic structure, 24m high and with a base 35m in diameter, is made, not from stone, but from reinforced concrete and its shape does indeed resemble a six-petal lotus flower. You can see it from far away, towering over the vast emptiness of the fields around it. A path made of wooden railway sleepers, salvaged from the train line that used to take trains to the camp, leads right to the base of the monument. Inside the base there are some empty concrete alcoves and at the far end of this inner sanctum is a bronze plaque, mounted onto yet more wooden sleepers, that quotes a few lines from a (once) famous Croatian anti-war poem. Towards the eastern end of the complex, which is an empty field except for a few poplar trees, some mass graves are marked with oblong concrete shapes in the ground, and another bronze plaque quotes another part from the same poem. 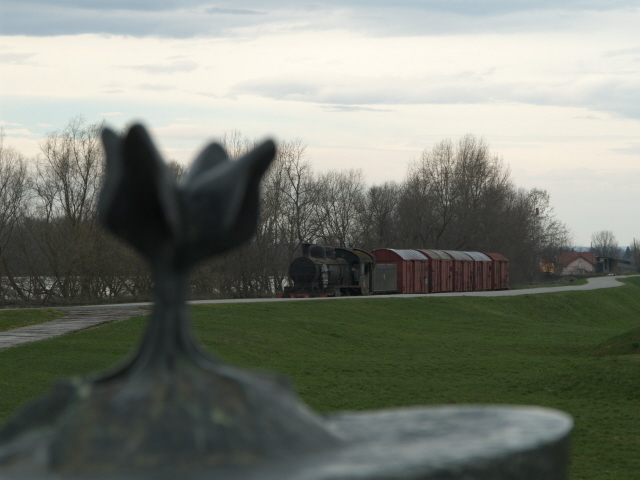 The only authentic object on open-air display is an old steam train with five cattle cars, such as were used to deport victims to the camp of Jasenovac. There are steps leading up to the sliding doors of the carriages, but these are padlocked and you can't look in. 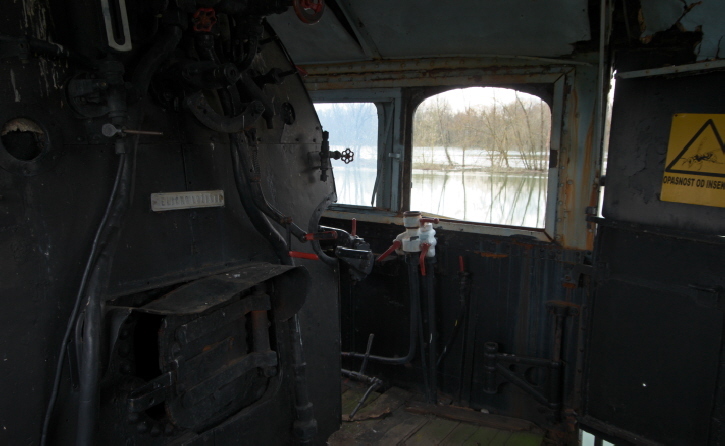 If you clamber up the side of the locomotive, though, you can look into the train driver's cabin. But there isn't much there, except for a sign warning of insects (!). When I was there in late March 2018, the Sava River that flows past the southern rim of the site, had burst its banks and flooded the plains south of the dam that protects the memorial field. Since the train stands on tracks that are to the south of the dam, the waters nearly reached the train's wheels. When I then headed to the museum, a guy came out and informed me that the museum was temporarily closed, namely due to flood damage. So I couldn't see the main exhibition with my own eyes, but I was able to buy a museum catalogue plus a book about the history of Jasenovac and its political context. According to spomenikdatabase(dot)org the exhibition follows quite a multimedia approach, and only few artefacts are on display (such as documents, personal belongings of victims, metal eating bowls), but the texts on the interpretive placards and display labels come with English translations. Outside the museum building are also a few information panels on open-air display, and these I was able to see. They provide some background to the memorial design, and its prehistory and construction, as well as explaining what happened to the site during the Balkan wars (“Homeland War”) and its aftermath. The panels are bilingual, in Croatian and English and the translations are of good quality. All in all, even though I wasn't able to visit the main museum exhibition, Jasenovac was still a major point on my field trip to Croatia around Easter time 2018. Since the darkest chapters of Croatian history during WWII and the Ustashe Nazis' reign of terror are not so well documented/commemorated elsewhere (certainly not compared to the many memorials and exhibitions relating to the “Homeland War”), this is one of the most important sites in the country. Not to be missed! Location: on the southern edge of the central inland part of Croatia, ca. 70 miles (110 km) south-east of Zagreb, right on the Sava River, which forms the border with Bosnia & Herzegovina here. Access and costs: a bit remote, but not too hard to get to, at least by car; free. Details: Getting to Jasenovac is easiest by car. From Zagreb it's a pretty straightforward drive down the E70 trunk road (toll motorway) and then ca. 5 miles (9 km) along road No. 47. It's well enough signposted. At the site you can use the (free) car park in front of the museum, but you can also drive into the site on the road atop the dam that protects the site from the waters of the Sava River. There's a small parking space just behind the deportation train and the spot where the wooden walking path towards the monument branches off (obviously you cannot drive on that). Alternatively you could also get to Jasenovac by train – there's a regional railway line with a stop to the north of the village, which is a ca. 20-minute walk away from the memorial site. Trains from Zagreb's main station – with a change in Sunja (for trains going to Novska) – take between two and a half to three hours one way. The outdoor memorial site is in theory freely accessible at all times (but only daylight hours really make sense). The museum has the following opening times: daily except on public holidays, weekdays from 9 a.m. to 5 p.m., at weekends from 10 a.m. to 4 p.m., but in the winter (December to the end of February) open only on weekdays and only to 4 p.m., closed Sunday/Saturday. Guided tours for groups (also in English) are available by prior arrangement and cost 200 HRK. Time required: ca. an hour for the outdoor memorial site, plus perhaps another for the museum. Combinations with other dark destinations: Just across the Sava River, on the Bosnian side (actually part of the Republika Srpska – see under BiH) is the Donja Gradina Memorial Zone, which also commemorates the atrocities of Jasenovac, many victims of which were murdered at this site just a short distance from the main camp. Victims were specially transported from the camp across the river by barge to be tortured and murdered here. This is also where they were buried in vast mass graves. From what I could find out online, there isn't all that much at Donja Gradina today, just a few signs stating numbers of the dead of the various groups, using figures that are at the rather inflated end of the spectrum (claiming 700,000 in total). There's also a memorial stone, an installation involving the trunk of a willow tree (that victims were hanged from) as well as some vestiges of a soap factory (apparently the Ustashe made soap out of some of the victims' corpses!). I did not go to see this memorial as it would have required a border crossing (a bit upriver). There are said to be a memorial to, and some remains (including a watchtower) of the Stara Gradiška prison/camp that was associated with Jasenovac during WWII and remained in use as a penitentiary during the Yugoslav era until 1990. From 1991 it was again used as a concentration camp by Serbs during the “Homeland War” in Croatia. Unfortunately I only found out about this site after returning from my field trip in 2018, so I can't say anything first hand about it. Stara Gradiška is about a half-hour drive, 20 miles (30 km – as the crow flies) south-east of Jasenovac, also on the northern banks of the Sava River. All other Croatian sites of dark-tourism interest covered on this website are rather far away, with Zagreb being the fastest to reach (along the toll motorway E70), some 70 miles (110 km) to the north-west, while Vukovar to the east is 125 miles (200 km) away. Petrova Gora also seems near, just 55 miles (90 km) as the crow flies – but the actual driving distance is more like 90 miles (150 km), and that along mostly slow roads (unless you do the faster detour via Zagreb). Combinations with non-dark destinations: Jasenovac does not lie in a part of Croatia that can be considered “touristy”, even though the meandering Sava River isn't without its appeal. But the closest real mainstream tourism destination would actually be Zagreb.